What if our existence is a product of its interruptions? What if the words that structure our lives are themselves governed by the periods and commas that bring them to a close, or our images by the cinematic cuts that mark them off? Are we, like Chekhov's clerk, who dreams of being pursued by angry exclamation marks, or Scorsese's Jake LaMotta, bloodied by one violently edited fight after another, the products of punctuation-or as Peter Szendy asks us to think of it, punchuation? 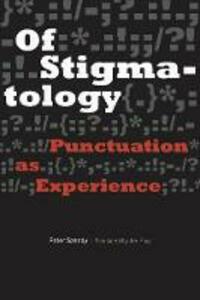 Of Stigmatology elaborates for the first time a general theory of punctuation. Beginning with punctuation marks in the common sense, Peter Szendy goes on to trace the effects of punctuation more broadly, arguing that looking and hearing are not passive acts of reception, but themselves punctuate the images and sounds they take in. Szendy reads an astonishing range of texts and traditions, from medical auscultation to literature (Chekhov, Sterne, Kafka), philosophy (Hegel, Nietzsche, Heidegger, Derrida), psychoanalysis (Lacan), and film (Raging Bull, The Trial, Fight Club). Repeatedly, what Szendy finds in these works is a punctuation that marks experience itself, that seeks (and ultimately fails) to bind the subject to itself. This is the stigmatology of the punctuation mark on the page that structures texts from ancient to digital, as well as the punchuation of experience, as though at the hands of a boxer.